Danish newspapers have reprinted one of several caricatures of the Prophet Muhammad which sparked violent protests across the Muslim world in 2005. 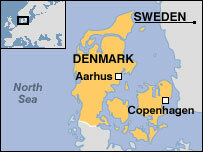 Of three suspects detained over the alleged plot on Tuesday, one - a Danish citizen - was released on Wednesday. The remaining two - Tunisian citizens - are set to be deported without trial. The cartoons were originally published by Jyllands-Posten in September 2005. 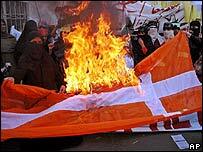 Danish embassies were attacked around the world and dozens died in riots that followed. Jyllands-Posten and many other major newspapers, including Politiken and Berlingske Tidende, reprinted the caricature in their Wednesday editions. The cartoon depicts Muhammad wearing a turban shaped like a bomb with a lit fuse. The editors said no-one should feel their life was threatened because of a drawing. "We are doing this to document what is at stake in this case, and to unambiguously back and support the freedom of speech that we as a newspaper will always defend," Berlingske Tidende said. The cartoon was also broadcast on national television, and even newspapers that were originally against the publication of the caricatures are now backing the campaign to defend freedom of speech, says the BBC's Thomas Buch-Andersen in Copenhagen. No strong reactions to the republication had been observed, a foreign ministry official told news agency AP. On Tuesday, the head of the Danish Security and Intelligence Service (Pet), Jakob Sharf, said its operatives had carried out pre-dawn raids in the Aarhus region. The three suspects - two Tunisians and a Dane of Moroccan origin - had been detained "after lengthy surveillance", he added. The Danish citizen was released pending further investigation, while the Tunisians will be held until they are expelled from the country. But lawyers and Muslim groups criticised the decision to deport the men without giving them a chance to defend themselves in court. Franz Wenzel, the lawyer for one of the men, told Danish TV that the fact that the Danish citizen had been released "for lack of evidence" while two foreigners were being expelled was "incomprehensible", AFP news agency reported. Meanwhile, Kasem Ahmed of the Islamic Faith Society in Denmark, condemned the alleged murder plot - but also criticised the newspapers' decision to republish the cartoons, saying they remained an insult to Muslims. The newspaper, based in Aarhus, said Mr Westergaard, 73, and his 66-year-old wife, Gitte, had been under police protection for the past three months. 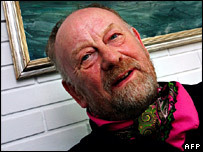 In a statement on Jyllands-Posten's website, Mr Westergaard said: "Of course I fear for my life when the police intelligence service say that some people have concrete plans to kill me. "But I have turned fear into anger and resentment."